The Fifteenth, Sixteenth and Seventeenth Dynasties of ancient Egypt are often combined under the group title, Second Intermediate Period. The Fifteenth Dynasty dates approximately from 1650 to 1550 BC. The Fifteenth Dynasty of Egypt was the first Hyksos dynasty, ruled from Avaris, without control of the entire land. The Hyksos preferred to stay in northern Egypt since they infiltrated from the north-east. The names and order of kings is uncertain. 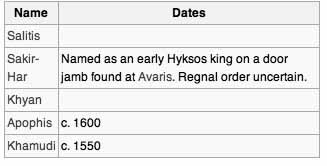 The Turin Kinglist indicates that there were six Hyksos kings, with an obscure Khamudi listed as the final king of the Fifteenth Dynasty. (line X.21 of the cited web link clearly provides this summary for the dynasty: "6 kings functioning 100+X years.") The surviving traces on the X figure appears to give the figure 8 which suggests that the summation should be read as 6 kings ruling 108 years. The Hyksos were an Asiatic people who took over the eastern Nile Delta during the twelfth dynasty, initiating the Second Intermediate Period of ancient Egypt. The Hyksos first appeared in Egypt during the eleventh dynasty, began their climb to power in the thirteenth dynasty, and came out of the second intermediate period in control of Avaris and the Delta. By the fifteenth dynasty, they ruled Lower Egypt, and at the end of the seventeenth dynasty, they were expelled. <> Some scholars argue there were two Apophis kings named Apepi I and Apepi II, but this is primarily due to the fact there are two known prenomens for this king: Awoserre and Aqenenre. However, the Danish Egyptologist Kim Ryholt maintains in his study of the Second Intermediate Period that these prenomens all refer to one man: Apepi I who ruled Egypt for 40+X years. This is also supported by the fact that this king employed a third prenomen during his reign: Nebkhepeshre. Apophis likely employed several different prenomens throughout various periods of his reign. This scenario is not unprecedented since later kings including the famous Ramesses II and Seti II are known to have used two different prenomens in their own reign. Salitis was the first king of the Hyksos Fifteenth dynasty of Egypt, who began to rule Egypt around 1648 BC. The precise dates of his rule are unknown. Northern Egypt was controlled by Hyksos rulers throughout the Dynasty. The Hyksos were people of Semitic origin who were thought to have invaded Egypt through the Sinai Peninsula and settled in the Delta. Other scholars regard this as propaganda and instead consider that the Hyksos were elements of the local Semitic population of Lower Egypt who assumed control of lower Egypt when the 13th dynasty of Egypt collapsed. The Hyksos controlled all the Nile Delta and Northern Egypt. Some scholars mention Salitis' name as "Sultan". This is an Arabic translation of the phrase 'powerful king' because the king was considered to be the founder of the first Hyksos dynasty. Salitis captured Memphis and placed himself in higher rank than any of the royal families in the city. 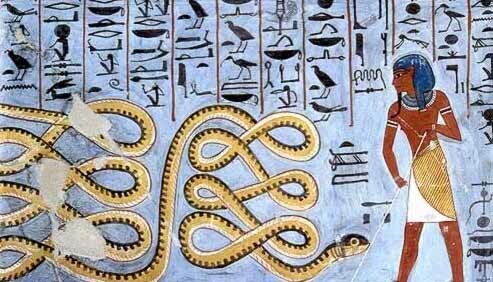 Apepi or Apophis was a ruler of Lower Egypt during the fifteenth dynasty and the end of the Second Intermediate Period that was dominated by this foreign dynasty of rulers called the Hyksos. According to the Turin King List, he ruled over the northern portion of Egypt for forty years, and would have ruled during the early half of the 16th century (BCE) if he outlived his southern rival, Kamose, but not Ahmose I. Although his reign only entailed northern Egypt, Apepi was dominant over most of Egypt during the early portion of his reign, and traded peacefully with the native, Theban Seventeenth dynasty to the south. While he may have exerted suzerainty over Upper Egypt during the beginning of his reign, the seventeenth dynasty eventually assumed control over this region, and the Hyksos were driven out of Egypt no more than fifteen years after his death. Neb-Khepesh-Re, A-Qenen-Re, and A-User-Re are three praenomina or throne names used by this same ruler during various parts of his reign.While some Egyptologists once believed that there were two separate kings who bore the name Apepi, namely Auserre Apepi and Aqenenre Apepi, it is now recognized that Khamudi succeeded Apepi I at Avaris and that there was only one king named Apepi or Apophis. Nebkhepeshre or "Re is the Lord of Strength" was Apepi's first prenomen; towards the middle of his reign, this Hyksos ruler adopted a new prenomen, Aqenenre, which translates as "The strength of Re is great." In the final decade or so of his reign, Apepi chose Auserre as his last prenomen. While the prenomen was altered, there is no difference in the translation of both Aqenenre and Auserre. Two of his sisters, Tani and Ziwat are known. Tani is mentioned on a door of a shrine in Avaris and on an offering table, Ziwat is mentioned on a bowl. A Prince Apepi, named on a seal (now in Berlin) is likely to have been his son. Apepi also had a daughter, named Herit, a vase belonging to her was found in the tomb of Amenhotep I, which might indicate that at some point his daughter may have been married to a Theban king. The vase, however, may just as well have been an item which was looted from Avaris after the eventual victory over the Hyksos by Ahmose I. Rather than building his own monuments, Apepi generally usurped the monuments of previous pharaohs by inscribing his own name over two sphinxes of Amenemhat II. Apepi is thought to have usurped the throne of northern Egypt after the death of his predecessor, Khyan, since the latter had designated his son, Yanassi, to be his successor on the throne as a foreign ruler. He was succeeded by Khamudi, the last Hyksos ruler. Ahmose I, who drove out the Hyksos kings from Egypt, established the 18th Dynasty. In the Ramesside era, he is recorded as worshiping Seth in a monolatric way: "[He] chose for his Lord the god Seth. He didn't worship any other deity in the whole land except Seth." Jan Assmann argues that because the Ancient Egyptians could never conceive of a "lonely" god lacking personality, Seth the desert god, who was worshiped exclusively, represented a manifestation of evil. It is generally believed that Ahmose defeated the Hyksos king by his 18th or 19th year. This is suggested by "a graffito in the quarry at Tura whereby 'oxen from Canaan' were used at the opening of the quarry in Ahmose's regnal year 22." Since the cattle could only have been brought after Ahmose's 3 year long siege of the South Canaanite town of Sharuhen which followed after the fall of Avaris, this means the reign of Khamudi must have terminated by Year 18 or 19 of Ahmose's 25 year reign at the very latest. The Hyksos were a foreign line of rulers who invaded Egypt and ruled for several generations before this defeat by Ahmose a native ruler from Thebes, who drove them from Egypt at that time.